Now you can have full color messages in your key chains. 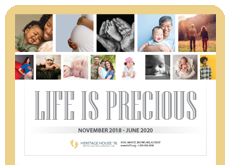 Pro-Life messages come to life with some of our most popular designs. Priced low enough in quantity to use as handouts. Designs are printed on both sides. Pro-Life messages come to life with some of our most popular key chain designs. Each design is created in full-color and printed on both sides. Priced low enough in quantity to use as handouts. Pro-Life messages come to life with some of our most popular key chain designs. Each design is created in full-color and printed on both sides. NEW! Pro-Life messages come to life with some of our most popular key chain designs. Each design is created in full-color and printed on both sides.